Global events of the early twenty-first century have placed new stress on the relationship among anthropology, governance, and war. Facing prolonged insurgency, segments of the U.S. military have taken a new interest in anthropology, prompting intense ethical and scholarly debate. 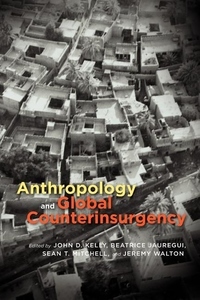 Inspired by these issues, the essays in Anthropology and Global Counterinsurgency consider how anthropologists can, should, and do respond to military overtures, and they articulate anthropological perspectives on global war and power relations. This book investigates the shifting boundaries between military and civil state violence; perceptions and effects of American power around the globe; the history of counterinsurgency doctrine and practice; and debate over culture, knowledge, and conscience in counterinsurgency. These wide-ranging essays shed new light on the fraught world of Pax Americana and on the ethical and political dilemmas faced by anthropologists and military personnel alike when attempting to understand and intervene in our world.